The zucchini are THE produce right now and I want to eat zucchini in every form. If you’re in the mood for pasta try this recipe or if you want a pie, try this one. But today is all about pizza. 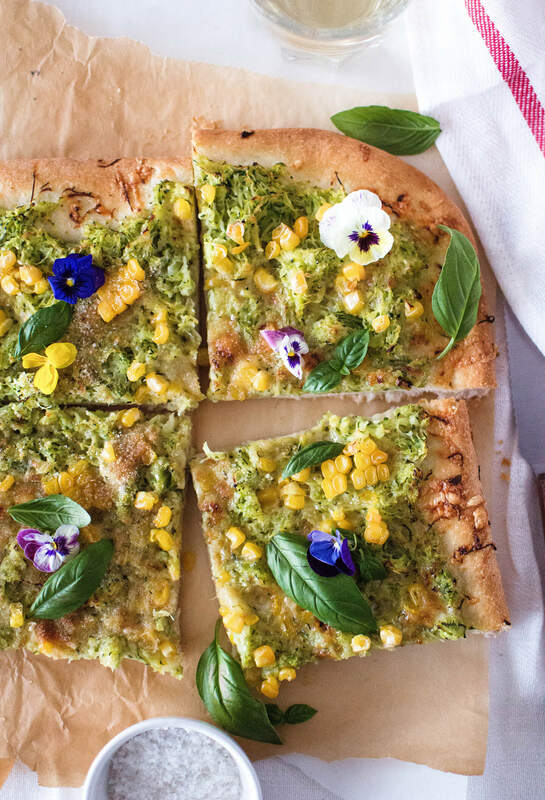 And more specifically zucchini on pizza. But, I wanted my own zucchini blanca pizza and so I made it. I found this recipe on Smitten Kitchen and it just looked so good. 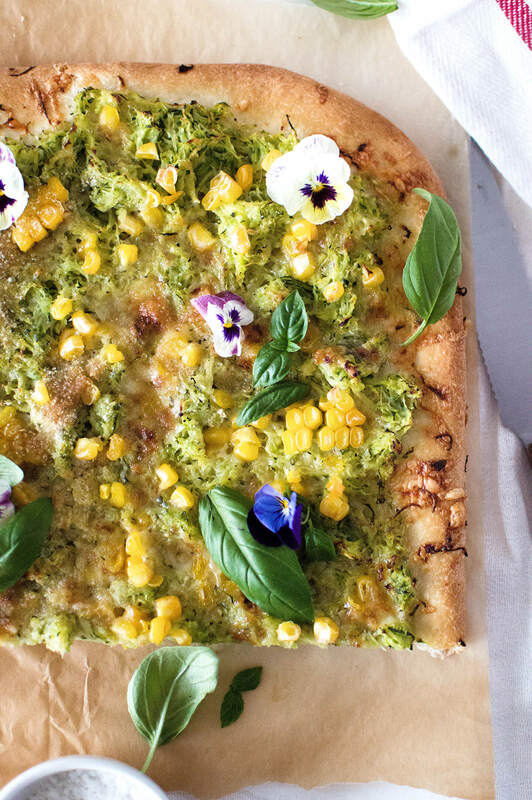 All that dough with all that zucchini, what’s not to like? 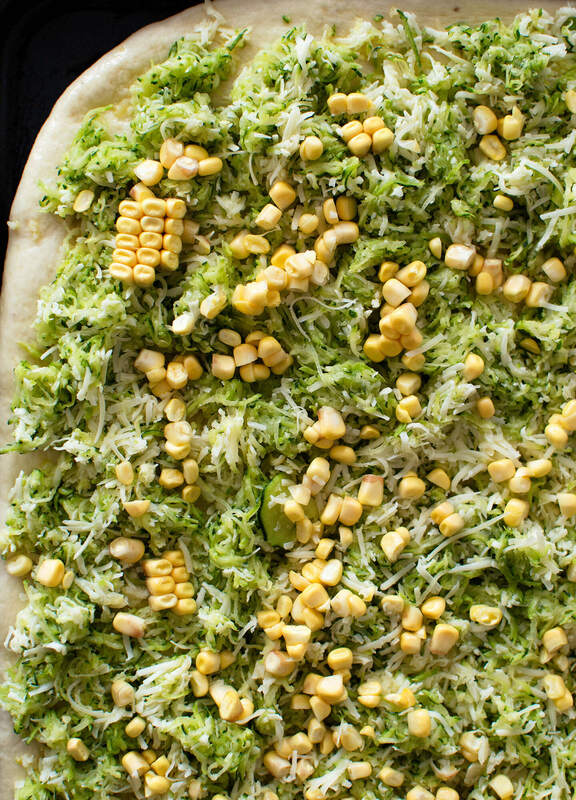 I love the idea of grated zucchini and cheese, baked to perfection on a crisp layer of dough. However, I wouldn’t be me without adding something else to it. 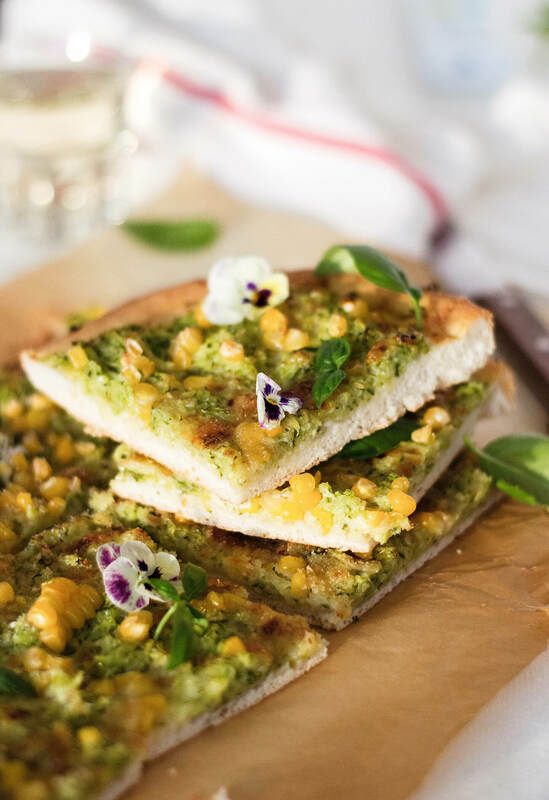 It’s not so much about making a simple recipe more complicated, it’s more just adding an extra layer of flavor and embracing the summer season (even with its numerous heatwaves). 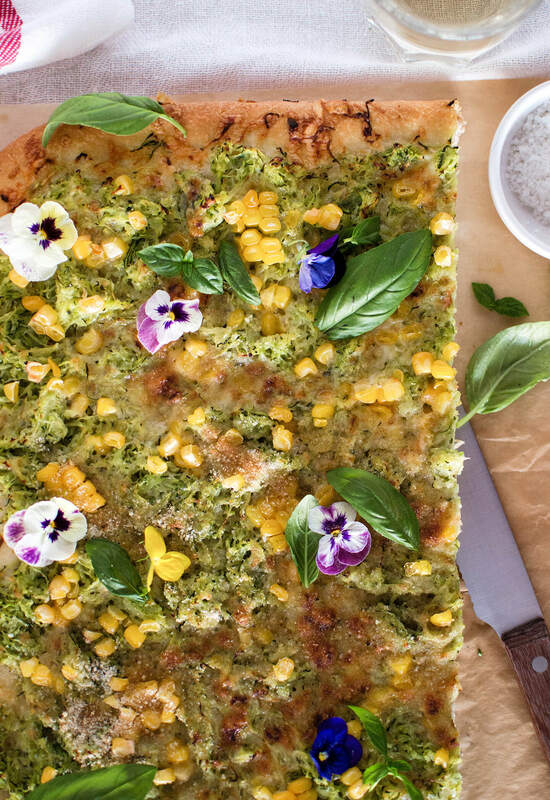 I add olive oil and some garlic powder as a base, top that with zucchini and cheese and wrap it up with fresh corn and breadcrumbs. 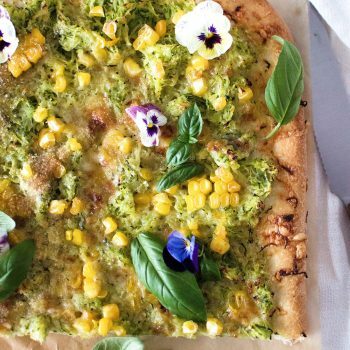 Once this summer corn zucchini pizza is baked, I also love to add some basil and edible flowers, to pretty it up. Which you totally don’t need to do, but I like serving options! Makes one half-sheet sized pizza or two quarter-sheet pizzas. If you’re making your own dough, whip it up, then cover it and set aside so it rises in peace. If you’re using store-bought, do the same. In either situation, the dough needs some time to rise, during which time you’ll prepare the rest. Prepare the zucchini: Grate zucchini on a box grater (the bigger holes) or in your food processor, using a grater attachment. My food processor only has a fine grater and a very coarse one, so I grated the zucchini finely to produce little zucchini spaghetti. Transfer zucchini to a bowl and toss with salt. Let stand for 30 minutes (or more), during which time the zucchini will release some of its water. Preheat oven to 220°C (430°F) and grease pan of choice with 1-2 tablespoons of sunflower oil. (See notes for pan size.) Stretch and roll out dough to somewhat match the pan (it doesn’t have to touch the edges) and transfer to pan. Brush with olive oil and sprinkle with garlic. Next, drain zucchini in a sieve, then squeeze with your hands to squeeze out as much water as you can. I like to use paper towels or a cheese cloth to help me with this. 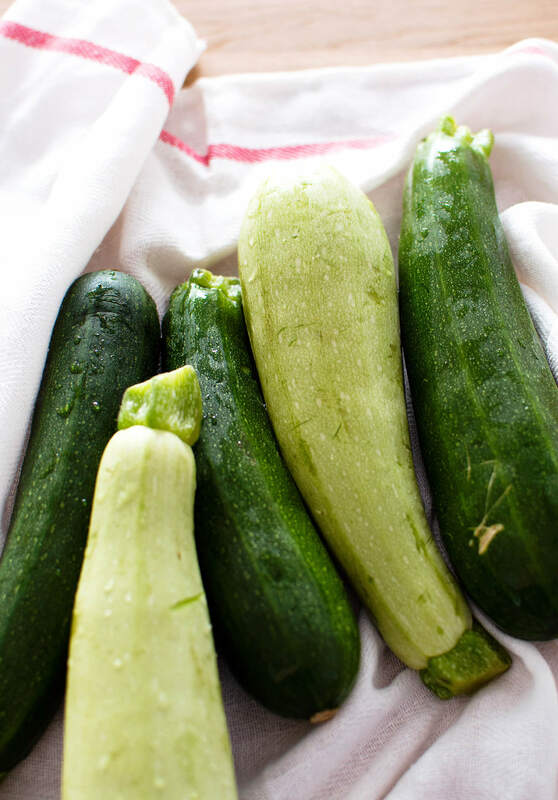 Transfer drained zucchini to a new, large bowl and fluff with a fork to pull apart clumps. Toss in the cheeses and mix until evenly intertwined with the zucchini. Spread mixture over the dough, all the way to the edges. Sprinkle with breadcrumbs, then with corn. Bake for about 20 minutes, until the top is golden brown and edges crisp. 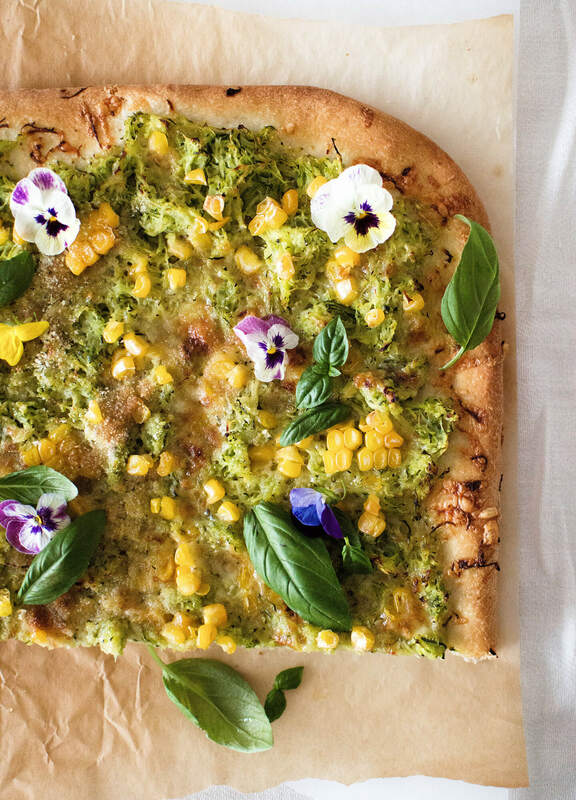 Remove from oven, sprinkle with basil and cut into squares. Serve and enjoy! “Classic” pan sizes are a tricky thing, because they vary country to country. What I use for pizza is a large tray pan, the kind that just fits into the oven. Some of you may know this as a half-sheet pan, others might call it “the oven pan”, because it often comes together with a new oven. The approximate sizes of my pizza pans are 30×36 cm (12 x 14 inches) and 36 x 43 cm (14 x 17 inches). The size of a half-sheet pan is 13 x 18 inches (33 x 46 cm), so you can see it’s very similar. So use whatever you have on hand, as long as you can fit it into the oven. You can also use smaller, quarter-sheet pans. Size of those is 9×13 inches (or 23 x 33 cm). Just divide the dough into 2 before rolling.